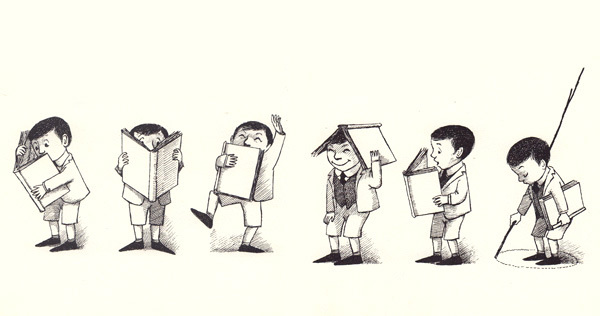 The question of why we read and what books actually do for us is as old as the written word itself, and as attractive. Galileo saw reading as a way of having superhuman powers. For Kafka, books were “the axe for the frozen sea within us”; Carl Sagan held them as “proof that humans are capable of working magic”; James Baldwin found in them a way to change one’s destiny; for Polish Nobel laureate Wis&lstrok;awa Szymborska, they stood as our ultimate frontier of freedom. Originally delivered as a lecture for The Reading Agency, an English charity devoted to giving kids from all backgrounds an equal chance at the good life by fostering an early love of reading, the speech was later included in The View from the Cheap Seats: Selected Nonfiction (public library) — the terrific compendium that gave us Gaiman on the power of cautionary questions. I don’t think there is such a thing as a bad book for children. Every now and again it becomes fashionable among some adults to point at a subset of children’s books, a genre, perhaps, or an author, and to declare them bad books, books that children should be stopped from reading. I’ve seen it happen over and over; Enid Blyton was declared a bad author, so was R. L. Stine, so were dozens of others. Comics have been decried as fostering illiteracy. It’s tosh. It’s snobbery and it’s foolishness. There are no bad authors for children, that children like and want to read and seek out, because every child is different. They can find the stories they need to, and they bring themselves to stories. A hackneyed, worn-out idea isn’t hackneyed and worn out to someone encountering it for the first time. You don’t discourage children from reading because you feel they are reading the wrong thing. Fiction you do not like is the gateway drug to other books you may prefer them to read. And not everyone has the same taste as you. Well-meaning adults can easily destroy a child’s love of reading: stop them reading what they enjoy, or give them worthy-but-dull books that you like, the twenty- first-century equivalents of Victorian “improving” literature. You’ll wind up with a generation convinced that reading is uncool and, worse, unpleasant. When you watch TV or see a film, you are looking at things happening to other people. Prose fiction is something you build up from twenty-six letters and a handful of punctuation marks, and you, and you alone, using your imagination, create a world, and people it and look out through other eyes. You get to feel things, visit places and worlds you would never otherwise know. You learn that everyone else out there is a me, as well. You’re being someone else, and when you return to your own world, you’re going to be slightly changed. Fiction can show you a different world. It can take you somewhere you’ve never been. Once you’ve visited other worlds, like those who ate fairy fruit, you can never be entirely content with the world that you grew up in. And discontent is a good thing: people can modify and improve their worlds, leave them better, leave them different, if they’re discontented. I was lucky. I had an excellent local library growing up. I had the kind of parents who could be persuaded to drop me off in the library on their way to work in my summer holidays, and the kind of librarians who did not mind a small, unaccompanied boy heading back into the children’s library every morning and working his way through the card catalogue, looking for books with ghosts or magic or rockets in them, looking for vampires or detectives or witches or wonders. And when I had finished reading the children’s library I began on the adult books. They were good librarians. They liked books and they liked the books being read. They taught me how to order books from other libraries on interlibrary loans. They had no snobbery about anything I read. 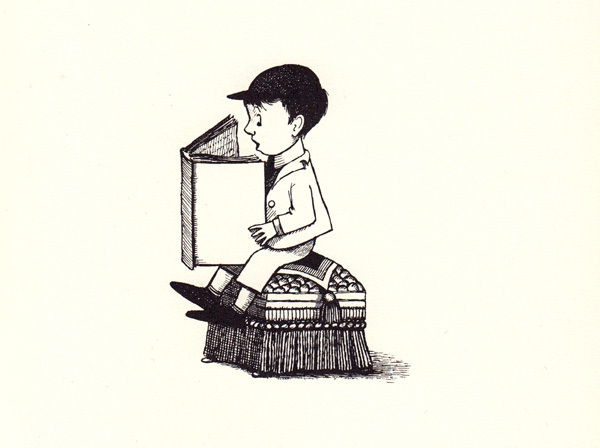 They just seemed to like that there was this wide-eyed little boy who loved to read, and they would talk to me about the books I was reading, they would find me other books in a series, they would help. They treated me as another reader — nothing less, nothing more — which meant they treated me with respect. I was not used to being treated with respect as an eight-year-old. Libraries are about Freedom. Freedom to read, freedom of ideas, freedom of communication. They are about education (which is not a process that finishes the day we leave school or university), about entertainment, about making safe spaces, and about access to information. As Douglas Adams once pointed out to me, over twenty years before the Kindle showed up, a physical book is like a shark. Sharks are old: there were sharks in the ocean before the dinosaurs. And the reason there are still sharks around is that sharks are better at being sharks than anything else is. Physical books are tough, hard to destroy, bath resistant, solar operated, feel good in your hand: they are good at being books, and there will always be a place for them. We need libraries. We need books. We need literate citizens. I do not care — I do not believe it matters — whether these books are paper or digital, whether you are reading on a scroll or scrolling on a screen. The content is the important thing. But a book is also the content, and that’s important. We have an obligation to read aloud to our children. To read them things they enjoy. To read to them stories we are already tired of. To do the voices, to make it interesting, and not to stop reading to them just because they learn to read to themselves. We have an obligation to use reading-aloud time as bonding time, as time when no phones are being checked, when the distractions of the world are put aside. We have an obligation to use the language. To push ourselves: to find out what words mean and how to deploy them, to communicate clearly, to say what we mean. We must not attempt to freeze language, or to pretend it is a dead thing that must be revered, but we should use it as a living thing, that flows, that borrows words, that allows meanings and pronunciations to change with time. We writers — and especially writers for children, but all writers — have an obligation to our readers: it’s the obligation to write true things, especially important when we are creating tales of people who do not exist in places that never were — to understand that truth is not in what happens but in what it tells us about who we are. Fiction is the lie that tells the truth, after all. We have an obligation not to bore our readers, but to make them need to turn the pages. One of the best cures for a reluctant reader, after all, is a tale they cannot stop themselves from reading. And while we must tell our readers true things and give them weapons and give them armor and pass on whatever wisdom we have gleaned from our short stay on this green world, we have an obligation not to preach, not to lecture, not to force predigested morals and messages down our readers’ throats like adult birds feeding their babies pre-masticated maggots; and we have an obligation never, ever, under any circumstances, to write anything for children to read that we would not want to read ourselves. We have an obligation to understand and to acknowledge that as writers for children we are doing important work, because if we mess it up and write dull books that turn children away from reading and from books, we’ve lessened our own future and diminished theirs. We all — adults and children, writers and readers — have an obligation to daydream. We have an obligation to imagine. It is easy to pretend that nobody can change anything, that we are in a world in which society is huge and the individual is less than nothing: an atom in a wall, a grain of rice in a rice field. But the truth is, individuals change their world over and over, individuals make the future, and they do it by imagining that things can be different. Just look around this room… Everything you can see, including the walls, was, at some point, imagined. Someone decided it might be easier to sit on a chair than on the ground and imagined the chair. Someone had to imagine a way that I could talk to you in London right now without us all getting rained on. This room and the things in it, and all the other things in this building, in this city, exist because, over and over and over, people imagined things. They daydreamed, they pondered, they made things that didn’t quite work, they described things that didn’t yet exist to people who laughed at them. And then, in time, they succeeded. Political movements, personal movements, all begin with people imagining another way of existing. Complement this particular portion of the wholly magnificent The View from the Cheap Seats with Hermann Hesse on the three types of readers, Ursula K. Le Guin on the sacredness of public libraries, and Virginia Woolf on how to read a book, then revisit Gaiman on creative courage, his eight rules of writing, and his philosophical dream, animated.